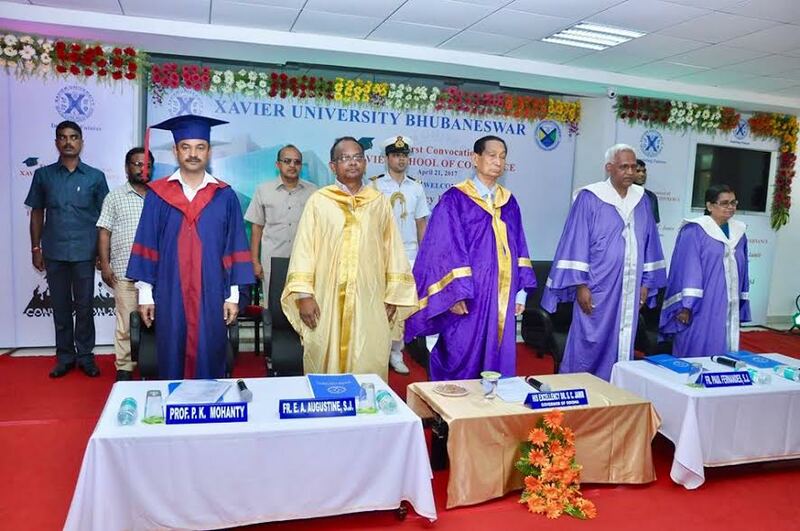 Bhubaneswar: Xavier University, Bhubaneswar(XUB), one of the premier Universities of India, held its 1st Undergraduate Convocation for the Xavier School of Commerce on April 21 2017. The Hon’ble Governor of Odisha Dr. S.C Jamir graced the occasion and presided over the function as the Visitor of the University and delivered the Convocation address. Amongst the distinguished personalities present were the Senior Government Officials, Officials of Xavier University Bhubaneswar and noted Academicians, and Corporate Leaders. A large number of parents of the graduating students were also present. The top rank holders across schools were presented with Gold Medals by the His Excellency, Dr. S.C Jamir for their achievements in Academic Excellence. The convocation ceremony commenced with a welcome note by Fr. E.A Augustine, S.J. Registrar, Xavier University Bhubaneswar. Prof P.K. Mohanty presented the Dean’s Report. Dr. Sanghamitra Mohanty, Member of Board of Governors of Xavier University Bhubaneswar and XIMB and Dr. Prof. Fr. Paul Fernandes, S.J., the Vice Chancellor also addressed the graduates. In his speech Father Paul, the Vice Chancellor highlighted various achievements of the University, faculty and students in the past year that had brought laurels and global recognition to Xavier University Bhubaneswar in the sphere of research, academia, sports and cultural activities. He congratulated the passing out batch of 2017. He told the students to be the light to the world, always have faith and never be afraid of hard work and excellence. He urged them to always rekindle the core values imparted to them. His Excellency, the Governor of Odisha congratulated the graduating students and spoke about this important milestone in the student’s life. Further, he elaborated on the importance of Education as the driving engine for growth and social development of the Country. He spoke about Technology, digitalisation, e-commerce, e- business etc. He spoke about the dynamic world and commerce education’s focus on new ideas and innovation. The reason for stating all these was that students must be taught to convert the classroom teaching into a more practical knowledge. He emphasized upon grooming the students not only on technical aspects but also on teaching morals and ethics. He also said that learning is a process and Knowledge is a vast unfathomable ocean. On this auspicious occasion the Governor also inaugurated the 200KWP roof top solar panel, the first Solar City project in Bhubaneswar. This will be further expanded in future. Representatives from OREDA and CESU also attended the programme. Alongside, His Excellency, also inaugurated the University’s Centre for Urban Management and Governance. This centre will go in a long way to help the Bhubaneswar Smart City Programme of the State Government.